According to the National Safety Council (NSC), falling is one of the primary causes of accidental injury in the United States. Approximately 8.9 million Americans visit hospital emergency rooms on an annual basis for treatment of injuries sustained in slips, trips, and falls. A number of these slip and falls occur because a property owner has acted in a negligent manner. In such cases, slip and fall victims deserve to hold the property owner accountable for any injury-related losses they suffered. Luckily, if you have been injured in a fall that you believe was someone else’s fault, a Long Beach attorney experienced in slip and fall accidents can help you recover for your losses through a personal injury claim. If you need this type of assistance, don’t hesitate to call the experienced team at Jamal Injury Law P.C. Long Beach property owners have a duty to keep their premises reasonably safe and free from hazards or dangerous conditions, but unfortunately this is not always the case. When someone slips, falls, and suffers injury because an owner failed to maintain the property or failed to warn visitors of a potential hazard, that owner has acted in a negligent manner. When someone’s negligence causes injury, the injured victim has the legal right to work with a lawyer and receive compensation from the negligent party to reimburse them for any accident-related losses. While the above list focuses on common types of slip and fall accidents, there are also countless other examples. Unfortunately, at Jamal Injury Law P.C. we have seen the devastating effects of these types of accidents firsthand. As a result of the above acts of negligence, slip and fall victims may suffer serious injuries. Slip and falls can cause broken or fractured bones, concussions or other traumatic brain injuries, and much more. Older adults are particularly at risk for suffering broken hips if they slip and fall. These injuries can require emergency treatment, hospital stays, physical therapy and rehabilitation, and much more. Additionally, many older adults who suffer broken hips are never able to live independently again. 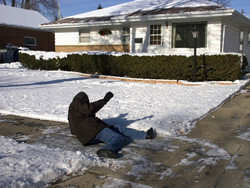 As you can see, slip and fall accidents may have a significant effect on a victim’s life. This is why it is essential to work with a local Long Beach lawyer if you experience this kind of injury. If you have been the victim of a slip and fall accident due to a dangerous condition on someone else’s property, you deserve to receive full compensation for all of your medical bills, lost income, pain and suffering, and more. Because slip and fall cases can be complex, to ensure that your case gets the best possible result, working with an experienced lawyer is often recommended. At Jamal Injury Law P.C., we offer free consultations and always handle personal injury cases on a contingency fee basis. This means that we never collect fees unless you win your case and are able to recover. Contacting an attorney can only help you, so you should never hesitate to call our Long Beach office at 714-907-1021 if you have suffered any type of injury.